let out [draw in] a kite 凧を揚げる[降ろす]. flý [sénd úp] a kíte Gó flý a kíte! From Middle English kyte, kite, kete, from 古期英語 cȳta (“kite, bittern”), from Proto-Germanic *kūtijô, diminutive of *kūts (“bird of prey”), from Proto-Indo-European *gū- (“to cry, screech”). Cognate with Scots kyt, kyte (“kite, bird of prey”), Middle High German kiuzelīn, kützlīn (“owling”), German Kauz (“barn owl, screech owl”). Any bird of subfamily Milvinae, with long wings and weak legs, feeding mostly on carrion and spending long periods soaring. A bird of genus Elanus, having thin pointed wings, that preys on rodents and hunts by hovering. Also, any bird of related genera in the subfamily Elaninae. (Britain, dialectal) A fish, the brill. 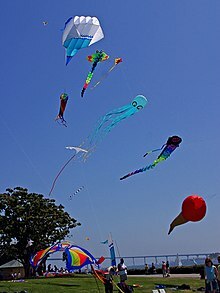 (まれに, usually with "go") To fly a kite. (banking, transitive, intransitive) To write a check on an account with insufficient funds, expecting that funds will become available by the time the check clears. 'An affair of honour?' said O'Flaherty, squaring himself. He smelt powder in everything. Andy also kept a box of that in his cell, although he didn't get it from me — I imagine he kited it from the prison laundry. (obsolete) To hunt with a hawk. Origin uncertain. Possibly from Middle English *kit, *kid (attested only in compounds: kidney), from 古期英語 cwiþ (“belly, womb”), from Proto-Germanic *kweþuz (“stomach, belly”), from Proto-Indo-European *gʷet-, *gut- (“swelling, rounding; stomach, entrails”), from Proto-Indo-European *gʷu-, *gū- (“to bend, curve, bow, vault, distend”). Cognate with Icelandic kýta (“stomach of a fish, roe”), West Flemish kijte, kiete (“fleshy part of the body”), Middle Low German kūt (“entrails”), Icelandic kviður (“stomach”), kviði (“womb”). (Britain dialectal, Northern England, Scotland) The stomach; belly.